85%+ of Facebook users typically scroll their newsfeed with the SOUND OFF on their device. That means, without adding captions, only 15% of the people who see your video will know what you are saying, and you’ll have wasted time, effort, and money getting your video in front of the other 85%. These are computer generated, using software that converts your voice to text. The problem is, often auto-generated captions are riddled with errors that you will have to manually correct. A 2-minute video I auto generated captions for took me 20 minutes to correct all the errors! I send all my videos to Rev.com, where a human listens to the video and prepares the caption file. Their turnaround is quick, usually less than 8 hours for videos of less than 15 minutes, less than 24 hours for videos up to 90 minutes, and 48 hours for longer videos. Their pricing is extremely reasonable, $1 per video minute. 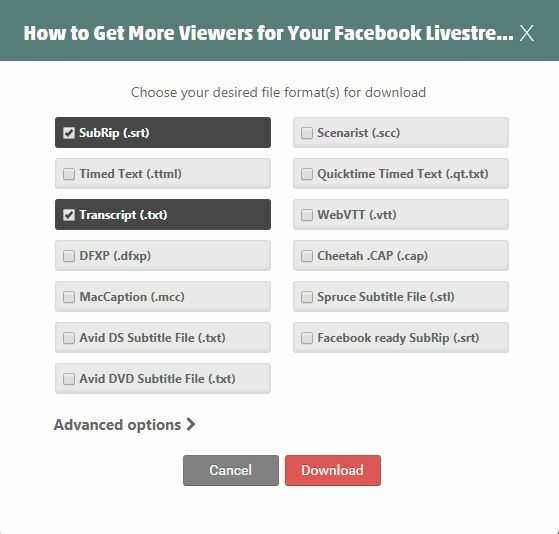 When your order is complete, you will be able to check and make any required edits to your captions, before downloading the file to add to your video. 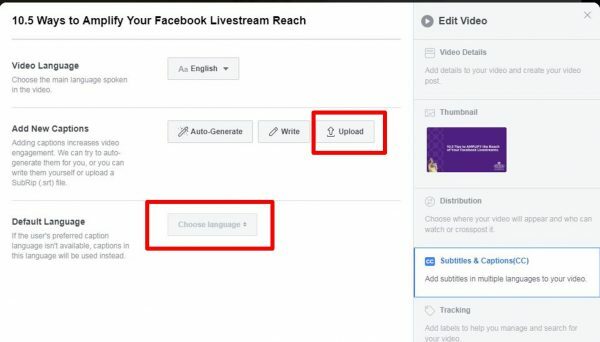 In this post, I’m going to walk through the process of ordering, editing, and uploading your video captions to Facebook videos – without the need for any external software. First, go to Rev.com here and sign up for your free $10 voucher. As a new customer of Rev, this will get you 10 minutes of your videos captioned for free. Create an account at Rev.com and log in. Go to the home page and select ‘Captions’. Next, choose ‘Place New Order’. YouTube: Connect your YouTube account to Rev and then select the (unlisted or public) video/s you require captions for. If you select this option, Rev will add your captions to your YouTube video for you. Vimeo: Connect your Vimeo account to Rev and then select the video/s you require captions for. If you select this option, Rev will add your captions to your Vimeo video for you. Complete your payment details and submit your order. Once your order has been submitted, you will be invited to tell them the name of the speaker. You will receive an email from Rev when your order is complete. DO NOT DOWNLOAD THE FILE VIA THIS EMAIL! When you see the email in your inbox, log into your Rev account on your web browser. Locate your order at the top of the list and click on the order number to open the summary page. Click on ‘Edit’ and you’ll be taken to the Captions Editor. Here you’ll find your video at the top of the page, and underneath, your captions. Skim through your captions and if you find an error that you need to correct, simply click in the caption to edit it. Your changes will be saved automatically as you go along. Upload to YouTube/Vimeo – if you connected your YouTube or Vimeo account to Rev, you will see a red button on the top right of your screen to send to YouTube/Vimeo. Click on the red button to send your revised captions to your video. The option to download will be via the triangle to the right of the button you just clicked. You will be presented with a pop up showing the various formats that you can download your caption file in. Transcript (.txt) – a Notepad document containing your captions as a block of text that with a simple edit can become a transcript you can repurpose into a blog post. After making your selections, click on the red download button to download a .zip folder of both files. Open the .zip folder and save your .srt and .txt files. Before you can add your captions file to Facebook, you have to slightly rename your captions file to add your Facebook language code. Your existing filename will be: name of file.srt. If your Facebook language is set to English US, your filename needs to be renamed as name of file,en_US.srt. If you don’t know which language your account is set to, check the language settings of your personal Facebook account, or attempt to upload the .srt file with its current name and Facebook should tell you the language code you need to add. 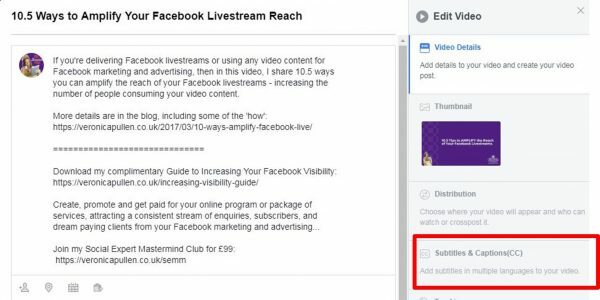 If you have not yet uploaded your video to your Facebook page. Select ‘Videos’ from the left-hand menu. Upload your video and add the text as normal. If you have already uploaded your video. Click on the … top right of your video post on your page, or bottom right if you’re viewing the video. Select, ‘Edit Post’ or ‘Edit Video’. Click on ‘Subtitles and Captions’ on the right-hand side of the upload/edit screen. Locate the (renamed) .srt file and upload. Change the default language via the drop down menu, to English UK or English US, depending on which filename language extension you added. Your video now has captions enabled. I recommend you check your captions are showing on your desktop/laptop. Whether they show on your phone will be dependent on your settings but they should show automatically on your computer. When you downloaded your .srt file earlier, I also recommend you download a .txt file. This .txt file is a block of text that contains all your captions as one huge paragraph. Locate the .txt file and double click to open. It will open in Notepad. Highlight ALL the text, right click, copy. Paste the text into a new Word document. Go through the text to edit in paragraphs, making any other edits as required, and you will have a free transcript of your video that you can repurpose in a variety of different ways: use as a transcript, the basis of a blog post like this one, or use it later when you come to write your book, for example. 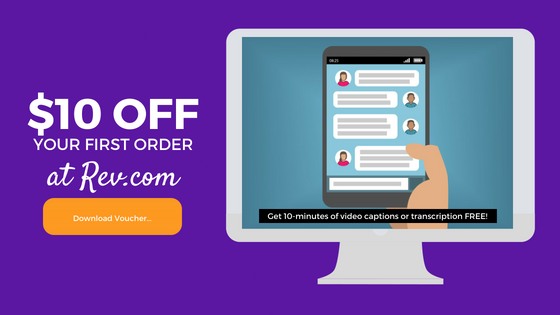 1: Request your FREE $10 coupon from Rev and receive 10 minutes of video captions for FREE!